"I made up this recipe one chilly weeknight to stave off a cold. I was surprised at how delicious the soup was! The file powder makes it nice and thick, but it may be left out. A warm loaf of sourdough bread is all you need to complete your meal!" Melt the butter in a large saucepan over medium heat. Stir in the onion and celery. Cook until tender. Mix in the potatoes, carrot, and garlic. Continue to cook and stir about 5 minutes, until the potatoes are well coated with butter. Season the mixture with allspice, cumin, cayenne pepper, cloves, and pepper. Pour in the vegetable broth, and mix in the lentils. Add water, increasing the amount as necessary to cover all ingredients. Bring to a boil, reduce heat, and stir in the kale. Cook, stirring occasionally, 35 to 45 minutes, until the lentils are tender. Mix in the cilantro and file powder. Continue cooking about 5 minutes, or to desired thickness. 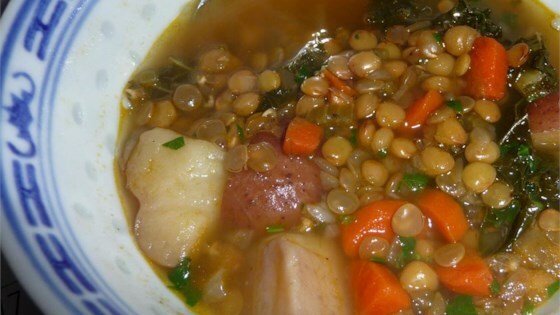 This is one of the best lentil soups I have tried. I was cleaning out the fridge and wanted to use up some kale, celery, parsey and potatoes. This soup is full-bodied and delicious. What a great recipe.